Now that all of the full-size rips are mounted I placed some plasticard sheets on top, to simulate the main deck. In this shot, the overall shape is visible pretty good. Itkovian - I created some templates on my PC in Corel Draw. They include the center of the holes to ease drilling too. Then I printed them on normal paper and this I glued with rubber cement (called "Fixo gum" by Marabu). After cutting the paper peels of nicely, and any remains of the cement can easily be rubbed away. Next I mounted some stabilizing stips. The strips between each rip are cut accoring to the measurements on the bottm, to ensure there is no width variation. Then some additional stips accross the width. 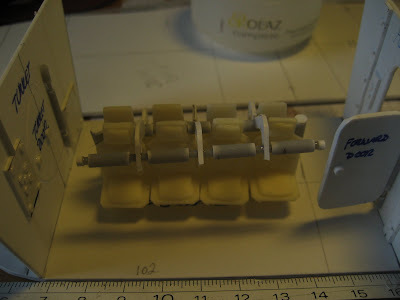 And here you can see the rear end which will have a slightly different shape, due to the 3 main rotors/engines. Finally I had some time to tinker some more with the shape of the Athena main body. I really had a lot to do at work, and some real-live commitments left me less time than normal to work on this project. But now I think I found a shape I can work with. So I built the first three rips and mounted them. 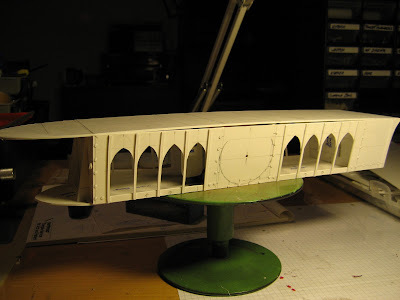 With a supporting beam in the middle (as the whole "flat top" will rest on these). So this now resembles pretty much the shape "C" I had drawn in the previous post. 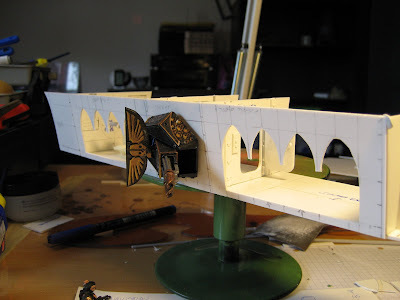 Also, this shape has enough overhang that allows for some bombing apreatus'. 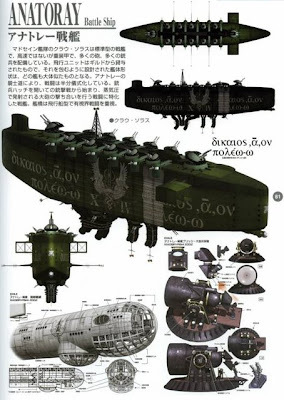 I really like the way the bombs are visible on the C&C Kirov, but for this it is allready loo late. 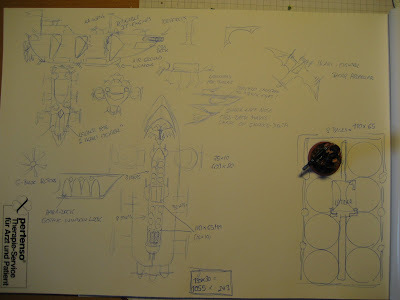 Nvertheless, since many things will be inside the float body (including an oberservation deck and the engines) I will make it look that the bombs are inside and two bomb bays are then visible. So, I continued last night and made 4 more rips (7 out of 9 on the gondola). For size comparison I placed an Kaskin stormtrooper and a St. Celestine here. From here there will be about 5 more rips forward, but each one being smaller, thus creating a pointy nose. In the rear there will be probably be another 3 or 4. The holes I have in the rips are planned to take some rods or pipes to give support. 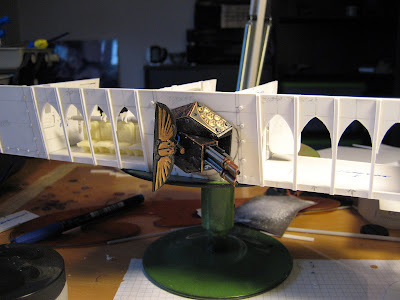 Basically the body will be empty, except for the Observation deck (like a sharks mouth) that will be visible from the outside, and whatever I need to mount the 3 wing sets and the bomb bays. So, I think this will keep the Athena looking blimpy enough, while it will give me the room for a flat top. For game purposes, I can't see the Athena moving on the board, I rahter think it is placed once, in the middle, over the map area, and there it remains during the match. Hi guys here's another sketch of how I envision the ATHENA. Mikael, I fully agree with you on the football/blimp form. 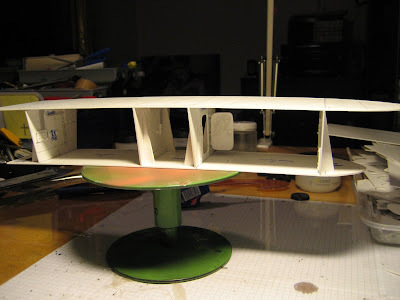 But I have to do a cut on the top, so I can place my main deck on it, and I have to cut the rear end, so i have room for the 3 engines/propellers. If you look at the sketch above, the rip I built yesterday pretty much follows "A" - too wide, too squatty. I will have to go more into the format of "B".... in the end, I want it to look like the "C" outline. Most other weapons will be AA weapons to fight off any fighters and interceptors - so I think gatlings will be the order. Maybe an additional missile pot. 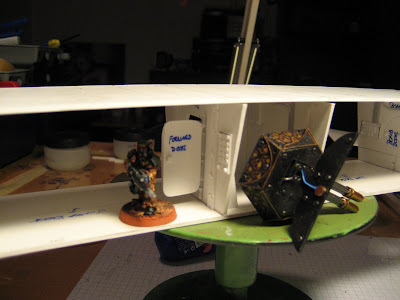 Besides some sculpting experiments I spent the last few days fideling with the outline of the airship. I finally setteled on the blimp-ish outline and prepared the ribs of the airframe on the computer for printout. 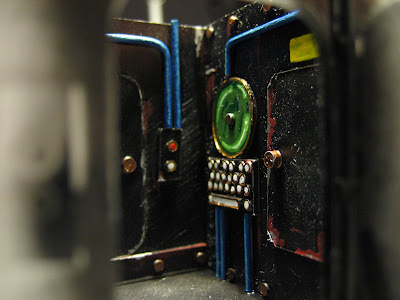 This I glued with (temporary) rubber cement to the cardboard. Then I started to cut the first two ribs. 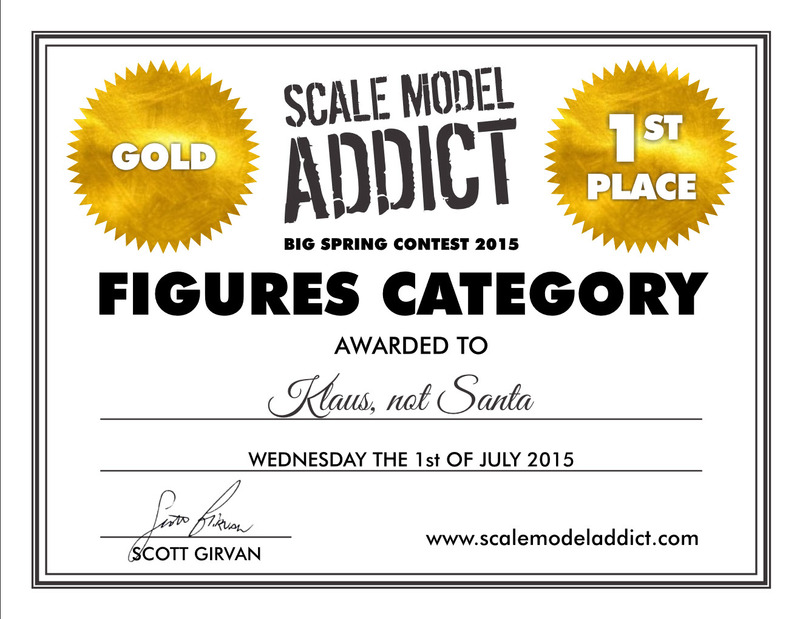 I'm afraid I have to go back to the drawing board. I don't really like the outline. The bottom part needs to be slimmer and rounder, but the top is OK I think. thanks for your feedback. Very valuable stuff here. SSG_Snuffy, I kind of agree on the turrets. I simply grabbed an existing turret from my ZEUS and mounted it to see if it woul work, and for the size. 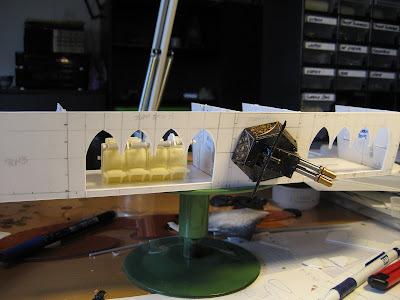 I like the idea of using the hexagonal shaped turrets (similar to the Chimera turrets too) - ball shaped turrets are (for me) a nightmare to produce, so I will definately have to see what i can come up with. 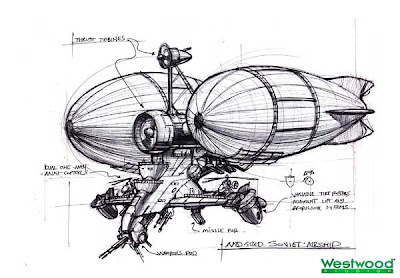 And you're right, it needs to be able to engage flying targets on all altitues - so kind of 360° arc of fire. 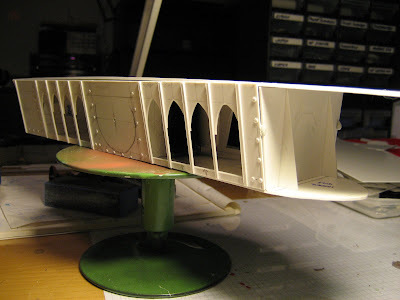 First I enforced the bottom of the gondola with some additional (riveted) beams. And then I started the nose. 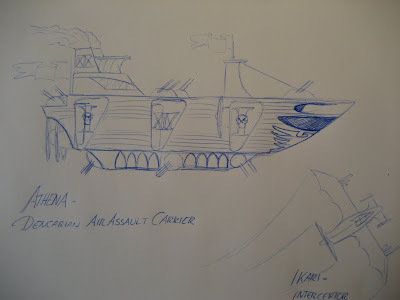 Next was another enforcing rim on top of the gondola, which is to serve as a connector between the gondola and the main ships body. Since I want to access the deck later on to paint and mount details, I figured to use some pins and holes to keep everything in place. Unfortunately I realized then, that mounting the pieces with pins and temporary rubber cement only leaves way to much room ofr error. Pieces are moving around, don't match exactly and I loose the measurements. 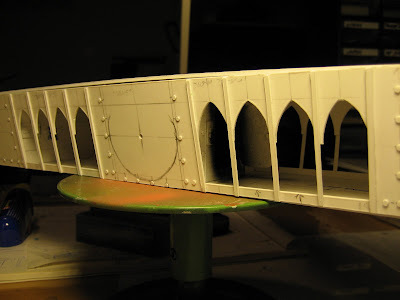 Then a quick basecoat with the airbrush. After that, standard procedure, drybrush with Boltgun Metal and another layer with Tin Bizz. Then the cables and pipes with Enchanted Blue. 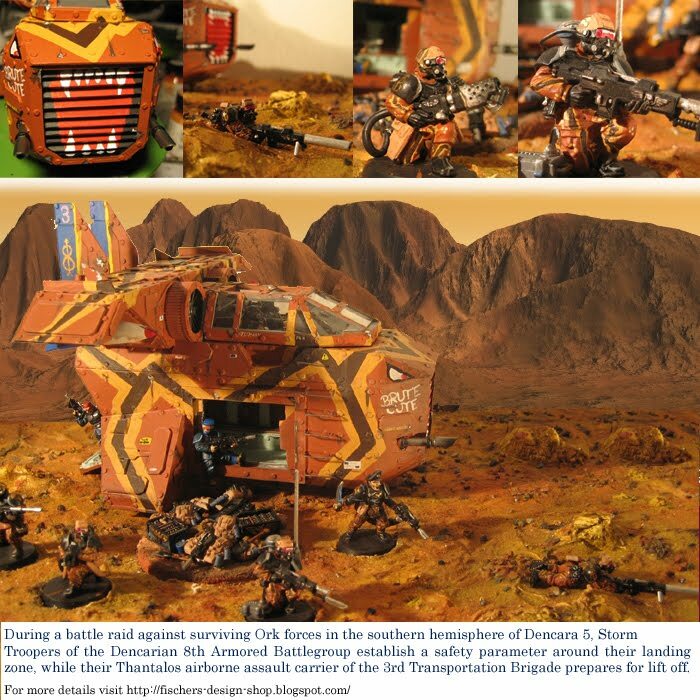 These images don't really show it, but that base with Bolgun and Tin Bizz really comes out nicely. After that detailing some red, yellow, and green, as well as Dwarf bronze for the scales and Shining Gold for the keys. 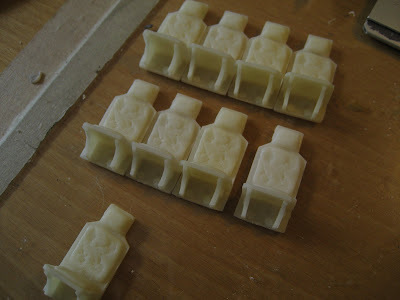 Highlighting the cables and Skull White for the inner pieces of the keys. Boltgun Metal and Chinmail for the actual scratches and then mount it. I had to do some filling and sanding at the nose joint, but that was minor. So that's the gondola, pretty much finished. Now I'm trying to plan the next steps. How will I shape the body? 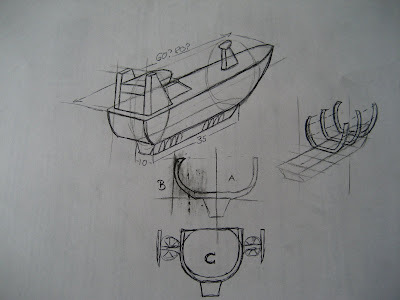 More ship like (like the dotted line), or more Blimp like (solid line)? 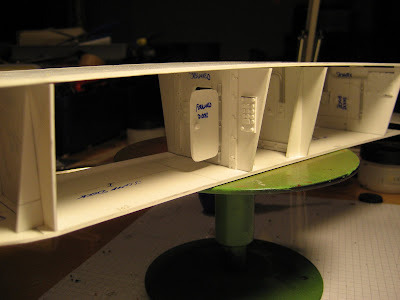 Also, will I have the upper deck more ship like (solid line) or more Blimp like (grey line)? As just mentioned in my reply to Itkovians comment, I'm not sure what kind of skin to use for the ATHENA. Or a more blimp like fabric skin like in the two samples below. For the all-metal skin, I would use .5mm thin plasticard, while for the fabric skin I'd use PVAed paper (or tissue) over thin ribs. What would you think is looking better? First off, I want to thank you all for your support and good wishes, as well as suggestions. 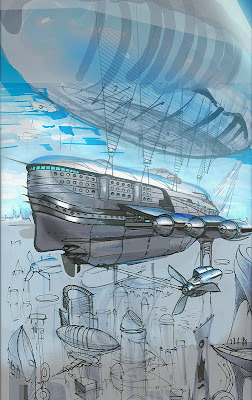 One of their songs is "Airship Pirates" - I mean just the title allready sparks sooooo many ideas, doesn't it? Well you know what happened, right? 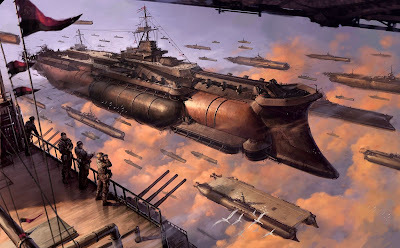 Dencara needs a Steampunk airship! Here are the first scetches I made for it. It will have two "Jump Decks" from where airborne troops (aka Paratrooper) can be launched, as well as a large variety of weapons. 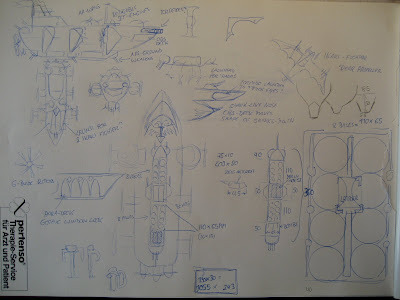 Maybe even a launch pad for an Interceptor plane....we'll see. 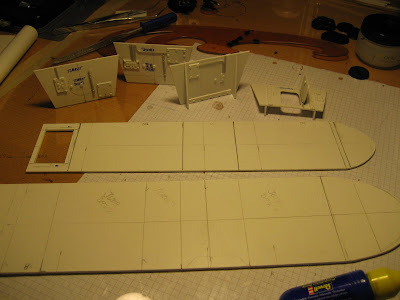 I started off with the Jump Decks to get the scale. 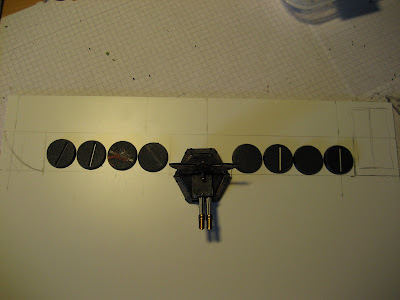 It will have to have room for 8 troopers, so i placed 8 bases and calculated size from there. 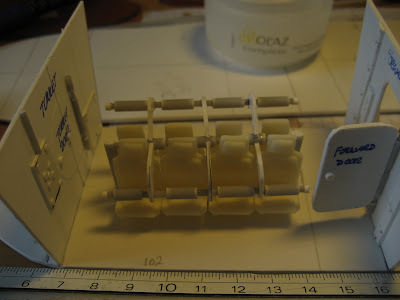 This is the first piece of plasticard, with the bases and a small turret (from the ZEUS) that I will use. 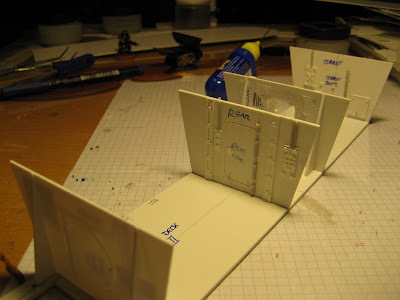 Then I produced the interior walls and doors for the sections. Here you can see the "roof" on it. A Stormtrooper and the turret for scale. 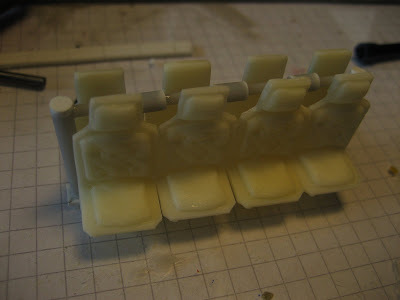 Luckily I still had some casted seats form then ZEUS left over, so I started on the seats for the Jump Deck. With some bars that will holde the troopers. And then it was time to give the side walls a first try. 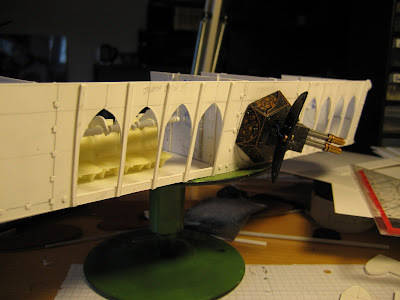 I will try to maintain the 40 gothic look together with the steampunk theme. 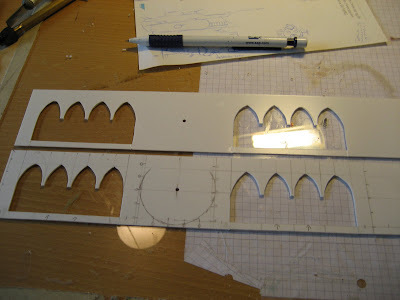 The two sides, with the holes that will mount the turrets. 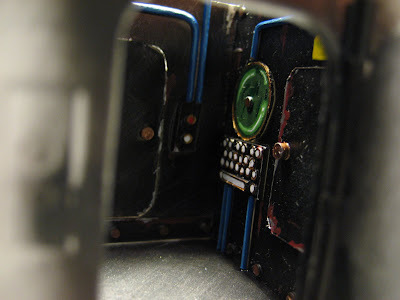 then some ornamenting and first rivets. 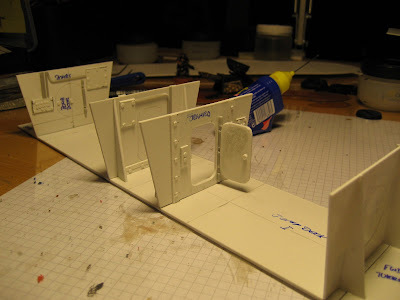 Since there are some areas that I won't be able to access again once the sides are mounted, I began to build these. 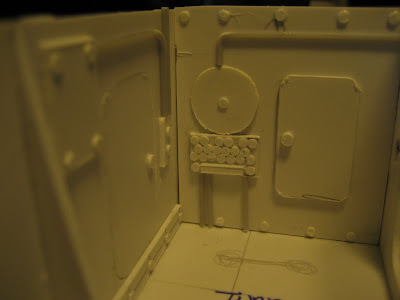 So these are the interior walls for the central turret section - they will be hardly visible, but through the one open door, one may get a glimpse at them. 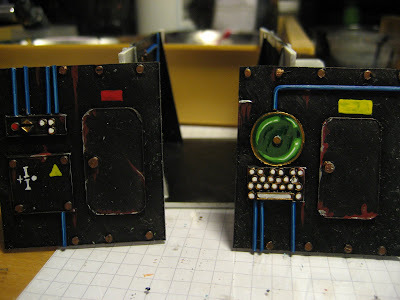 Then I painted them quickly in the same pattern as the ZEUS interior. All pieces of this lower deck together.